Where does luggage go after check in? What happens in the control tower? How do aeroplanes actually work? All this and more is revealed as we go behind-the-scenes to discover the secrets and inner workings of the airport. 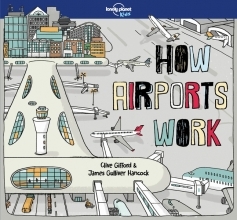 From a peek inside the maintenance hangar to the hustle and bustle of departures, this interactive, lift-the-flaps book will ensure kids and their parents never look at airports the same way.